If you’ve been following me for a few years, you’ve seen I’ve done an Oakland Athletics themed manicure for my first game every season. This year’s first game manicure has come later than the others considering I’ve been unemployed. However, thanks to Lorenza’s ticket deal booklets and Free Parking Tuesday, I went to my first game last night for the 2016 season! Since Tuesday was Pride Night and dedicated to the tragedy in Orlando, I wanted to finally try out water marbling and do a rainbow manicure. I watched a video and thought I had a handle on it. Unfortunately, after a few tries, it was clear that not all the polishes I’d picked were going to work very well as the first color was drying too quickly. But, as fate would have it, the yellow and green were both working excellently, so after one nail with red, orange, yellow, and green in it, I went on to just do yellow and green for my first water marble Oakland Athletics manicure. What a mess! It didn’t use as much polish as I thought it would, but it did make a big mess. I’m glad I anticipated that and broke out the paper plate underneath first! 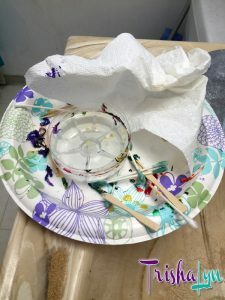 I think my “cup” of choice might also have been too big – I had a large water bottle with about an inch of water left in it, so I just cut the bottom off carefully to use. Next time, I’ll use a smaller cup to avoid that first color drying up too fast. I also learned that I need WAY more tape or liquid latex around my nails since I got far more polish on my nails than I’d anticipated. Both the polishes I used were Sally Hansen Insta-Dri, which I’ve also found works better for nail stamping than other non-stamping specific polishes too, so I think I’ll be picking up more. Usually I would think that a polish that’s on the thinner side isn’t ideal, but for the water marbling with time being a factor, it worked better because it dripped faster. 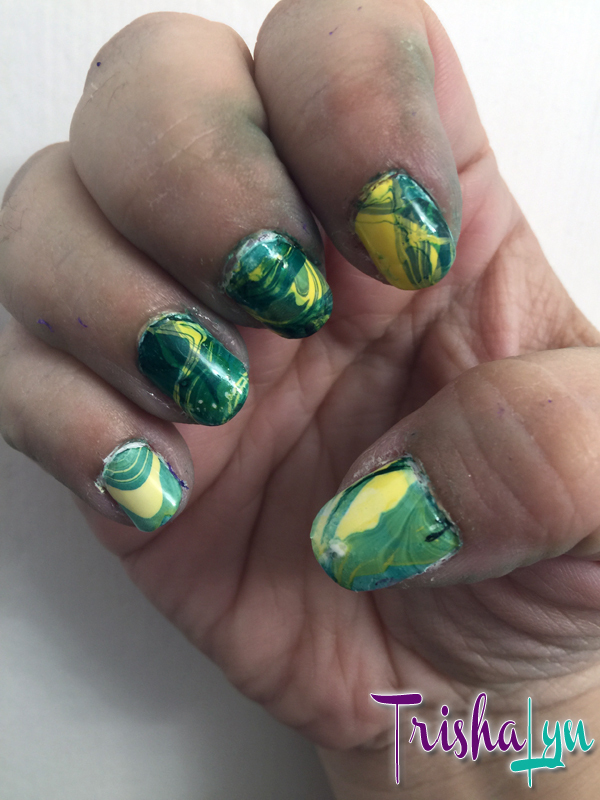 I used cotton swabs for the clean up, old appetizer picks I had on hand for the marbling, and Sally Hansen Insta-Dri Glow With It for the yellow and Sally Hansen Insta-Dri Jumpin’ Jade for the green. Oh, and I nearly forgot, but I also had Zoya Purity as a base white. The end result is a little chaotic, but since this was plan B and I didn’t even know exactly what I was getting myself into with plan A, it worked out well. As you can see though, my fingers are kind of a mess with the green polish. Like I said, I’d use liquid latex to block them off but I guess nowhere near enough. I underestimated how far into the marbled polish I would have to put my finger in with my current short nails. Next time – lots of tape! In case you were wondering, the A’s lost and we were late to the game, but it was a decent game with lots of back and forth and some nail biting moments!